During the NBA 2K17 community event, the one item that was to remain under a strict embargo was any discussion about the new MyCareer mode. 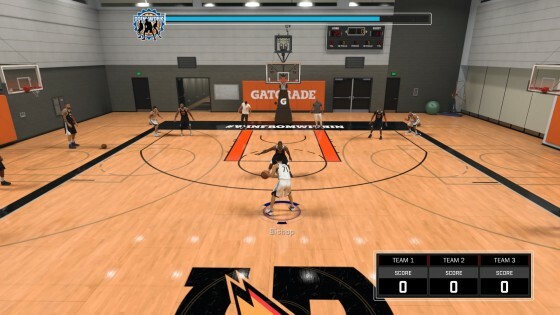 After last year’s Frequency Vibrations MyCareer story presented by Spike Lee, the NBA 2K team was focused on ways to improve the game’s most played mode, and Jeff Thomas, VP for Visual Concepts, was ready to share all that is new this year in MyCareer. As you likely know by now, on September 9 The Prelude will be available as a free download. Players can begin their MyCareer 11 days before the full release of NBA 2K17, and you’ll be able to play a significant amount of MyCareer leading up to when you’ll declare for the NBA Draft and start your NBA career. 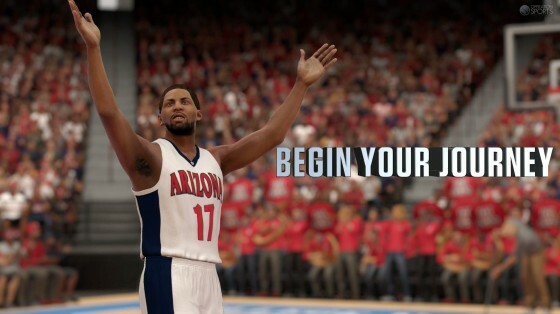 The Prelude will allow you to create your character, begin your unique MyCareer storyline, and make choices about things like where to go to college. As you continue through The Prelude, you’ll play up to four of your college games, all the while making an impact on your draft stock. If you’re thinking four games is way too short, Thomas anticipated this and said, “[MyCareer is] more than four college games, it’s a great college experience.” So for instance, early on in The Prelude you’ll attend your school’s own “Midnight Mania” game. More situations like this are peppered throughout MyCareer, the vast majority appearing well beyond what you’ll see in The Prelude’s small sampling. One interesting twist on The Prelude is that no matter what, you can only play the mode through one time. It’s all or nothing — if you performance suffers, you might be lucky to be picked up late in the second round. The reason the NBA 2K team did this was so that not everyone ended up being the first pick in the draft come September 20 when the game is released and you connect your MyPlayer to the retail game. Once you are in the retail version of the game, you can enter the NBA Draft to find out where your NBA legacy will begin. 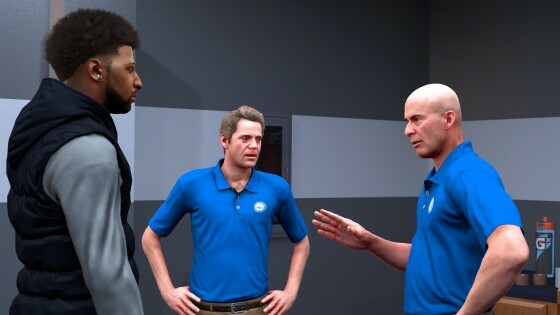 One of the big changes in MyCareer that the development team at 2K Games wanted to make was to allow for more unique storylines to develop in each MyPlayer’s story. Thus, instead of everyone living the same scripted storyline like with Frequency Vibrations last year, now you’ll be able to play through a series of branching decisions and actions that can lead you down different paths as you develop your own unique legacy of greatness, or perhaps even mediocrity (that’ll be my character, at least). This year, players will have a total of 10 schools to sign with, some being repeats, some being new. The schools included are: Oklahoma, Illinois, Georgia Tech, Michigan State (boo! ), Wake Forest, UConn, Louisville, Arizona, Georgetown and Kansas. When you start The Prelude for the first time, you’ll see that it features Kobe Bryant and Michael B. Jordan. From what I recall — and admittedly this part is a bit hazy as I stopped noting and just enjoyed the show for a few minutes here — Kobe talks you through some of the basics of MyCareer and what it takes to become a NBA player. Toward the end of this intro montage, Kobe teases that if anyone has a better career than his, he’ll have to lace ’em up again. Next, there is a montage of your high school locker room and school hallway, and you’re shown some highlights that make up your high school highlight reel at Lower Valley High where you’ve become a high school All-American. Your highlight reel alone has garnered over one million views. This montage transitions into you now shooting hoops in your high school gym with your head coach mere days after your senior season’s conclusion. You seem to be a happy and confident senior who knows he has a bright basketball future ahead of him. Your coach, who also is aware of your talents and who it’s made clear has a very good relationship with you, wants you to stay humble and remember the fundamentals: “I want to see more likes on videos of you making a good chest pass,” your coach says (obviously coach doesn’t understand how YouTube and Facebook work). After this scene plays out, MyCareer cuts to a sports show called :24 announcing your choice of college. Next, you’re given a choice in terms of the exact starting point where you’d prefer to start your college career. I didn’t get a very long look at this screen, but it is just as it sounds, different starting points for your pre-NBA MyCareer player. In the demo shown to me, your player started during his freshman year at the “Midnight Mania” event. The action started with a loud countdown from your school’s passionate fan base as the players began to walk out at midnight to be introduced for the first time, including that hot new All-American freshman — that would be you. At this point, the MyCareer montage video stopped, and we began to get glimpses of what else the mode had to offer. I wasn’t exactly clear on when — whether it’s before you start the mode or after you’re already a HS All-American — but at some point you will, like last year, create your player’s appearance, play style and the like. We were told that the NBA 2K development team put a lot of focus on individuals, so MyCareer should not be turning into a mode where all people end up being the same kind of player. Specifically, you’ll start by choosing your archetype, such as a “Stretch Big,” “Post Scorer,” “Paint Protector,” etc. You can make five of your play style badges Gold while the other badges you earn will be Bronze (thanks to @Shakedown2012 for tweeting that clarification). These options weren’t discussed in too much detail (there was a lot for 2K to cover), and the details covered here are based entirely on the images that were shown during this particular section of the player creation process. Thomas continued to discuss how MyCareer this year is much more focused on being an RPG as opposed to the same storyline being played through like in NBA 2K16. In contrast to this desire for uniqueness, you will be limited to the nickname “Prez,” the pre-determined nickname for your character. The reason a nickname is predetermined and used is because it allows for the development team to be more creative and realistic in creating dialogue for the actors, and the like. Speaking of actors, there are a handful of actors on-board this year for MyCareer, but one that was discussed with some detail is Hannibal Buress’ character who runs The Main Street Barbershop. This possibly means new hairstyles, perhaps? It wasn’t made clear to me one way or another (yet it was my most frequently asked question on Twitter @mikelowe_OS), but with a strong focus being placed on player uniqueness, I’d be willing to wager this is something we’ll see expanded on with NBA 2K17. In addition, while last year a lot of the MyCareer story was happening off the court — and there’s still some scenes that play out there as well in NBA 2K17 — this year MyCareer, “takes you much closer to the game of basketball,” said Thomas. Another new twist is you can now control and switch between two characters in what’s being called Dynamic Duos. Similar to the system used in Grand Theft Auto V, you’ll now have the option to play as two teammates and also make decisions for each character off the court as well. One cool tidbit I saw during this Dynamic Duo gameplay demo were little “tweets” appearing visually over spectators after a dunk during a crowd cut scene simulating the fans actually tweeting out their reaction to a big play. MyCourts can now include stunning looking murals of, for example, Lakers greats. Like other areas of MyCourt, murals are customizable and are quite impressive looking — a very nice touch to add to your MyCourt. Another new feature in MyCareer is “Doing Work” which is a tracking system/meter, inspired by Kobe Bryant while actually in-studio at 2K. Doing Work allows your MyPlayer to go into shootarounds to gain coveted upgrade spots. Instead of maxing out at an 88 or 89 overall, now you can earn these upgrades to increase your overall through Doing Work. 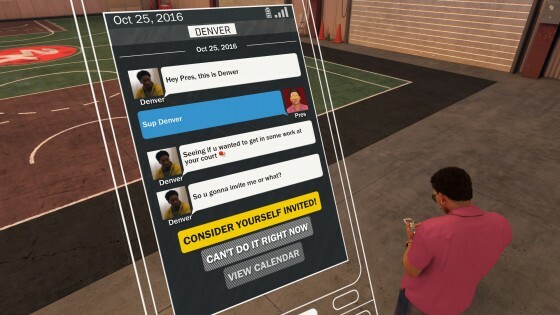 Your MyCareer connections now go deeper and will show up at your MyCourt where you can Do Work with them on drills, and so on. You’ll hear a knock at your (virtual) door, and the connection will be there to work with you on a three-pointer mini-game, for instance. You can choose different time slots to go Do Work, so early morning you might be the only one out on the court, while other times the whole team will be there along with your head coach. You’ll also be able to work on your physique and physical attributes by using items around your gym like a bench press. Lastly, endorsement opportunities for MyCareer this year include Mountain Dew, KIA, Nike, Under Armour, Jordan, Gatorade, Foot Locker, Adidas Tissot, Stance and more. Once you’re drafted, you’ll have four shoe companies approach you to sign you to a shoe deal. You will have to make a tough decision here though, as not all shoe contracts will be the same — another example of how each MyCareer experience is different. A tier one shoe contract might unlock just one shoe, where a tier two or tier three deal can unlock an entire shoe catalog. Note: I reached out to 2K Games on Thursday to inquire about the numerous Twitter questions I had coming in asking about new hairstyles and tattoos. As of Thursday evening, I have not heard back just yet. I will update this thread in the comments below once I have anything to report to you all.